Because the condition known as “dry eye” can have multiple causes, finding the best cure, or even any cure, has long challenged ophthalmologists and dry eye researchers. For some people with a chronic form of dry eye, there is no cure. Whatever the cause of dry eye, Natures Tears® EyeMist®, from Bio-Logic Aqua Research, offers the best and most soothing relief for complaints such as eye discomfort, blurry vision, red eyes and headache. Soothing temporary relief is often obtained even for individuals whose dry eye is considered incurable. The surface of the eye is 98% water and dry eye is defined as a partial loss of the water content of the eyes’ basal tear film. 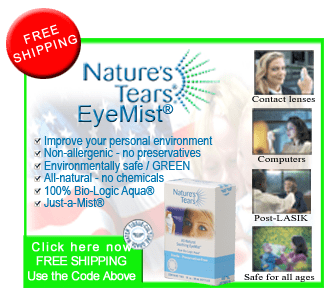 Although Natures Tears® EyeMist® is only intended for temporarily relief of common dry eye complaints, researchers have demonstrated that the product supplements and improves tear film water content. No dry eye “cure” claims to supplement or replace lost tear film water.